Realizing the Vision Campaign is Complete - Over Goal! 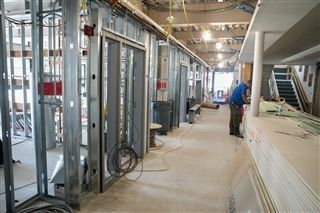 This has been an amazing year for Brimmer and May, with the groundbreaking in September, the ongoing construction of the new addition, and the continued focus on The Strategic Priorities for 2013 and Beyond; all while continuing to provide innovative programming for all students from Pre-K to 12. We have asked much of our community this year, and you have answered every one of our requests, including continued strong support of the Annual Fund, special requests for the Realizing the Vision Campaign, and wide-reaching support for the Bricks and Benches. Lastly, in early May, the Hastings Family issued a challenge to the Brimmer community to complete the Campaign--The Hastings Family Matching Gift Challenge promised to match each new gift or pledge made to the Realizing the Vision Campaign, up to $400,000, by May 31. We are thrilled to announce that we have completed the Hastings Challenge! The Hastings Challenge resulted in 150 gifts and pledges in 30 days, which were matched dollar for dollar, providing a total of $800,000 for the Realizing the Vision Campaign. We are excited to report that with the successful completion of the Hastings Challenge, Brimmer has raised a total of $8.1 million for The Campaign for Brimmer, Realizing the Vision. The Campaign had an original ambitious target of $7.5 million, which we have now exceeded. And, therefore, we are pleased to announce that we have successfully completed the Campaign!! As you recall, the funds raised in the Campaign will be used for construction of the new 2-story addition that includes innovation space, maker space, five new classrooms, a college counseling suite, a new entry, renovated kitchen and dining commons, as well as an Endowment for Faculty Innovation. We believe this new space puts Brimmer at the forefront of innovative programming. We wish to thank the entire Brimmer community for its support to enhance the educational experience for both current and future students! From the strategic planning process, to Bricks and Benches and gifts of every size that helped us meet the Hastings Challenge, our community has been unwavering in its support of our amazing School. We would like to thank the entire Campaign Steering Committee: Board Chair and Campaign Chair David Kreisler, Head of School Judy Guild, Director of Development Elizabeth Smith, Trustee Lisa Hastings, Mark Hastings, Trustee and Development Chair Kennie Grogan '76, Jeff Grogan, Trustee Susie Durocher, Trustee Linda Waintrup '72, Carrie Farmer '70, and our Campaign Consultants Lynne Cavenaugh and Jim Kitendaugh of the Wayland Group. We would also like to thank every single donor who helped make the Strategic Priorities a reality. Mark Hastings and Trustee Lisa Hastings at the Leadership Donor Party. Trustees at the Ground Breaking Ceremony. The Realizing the Vision Banner is displayed at School Meeting on January 21, 2016. Viewing the Realizing the Vision Chase Building plans. A student shows off plans for the Chase Building. Students show off their Campaign cookies! Students view architectural renderings of the Chase Building plans. Hastings Center opening dinner photos. Hastings Center Ribbon Cutting Ceremony. 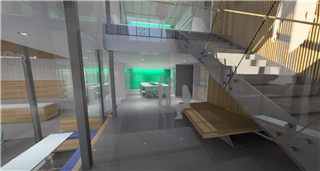 Click on the link above for an interior rendering of the new Chase addition (first floor).